A variety of styles and sizes are available, if what you require is not showing as being available please contact the support team who will be happy to help. All timber products are pressure treated and are of the highest quality. These fence panels are manufactured on site if you require a non-standard size please contact one of our team who will be happy to help. Covering an area of 19ft the pressure treated traditional lap fencing pack @ 3ft high consists .. Covering an area of 25ft 3" the pressure treated traditional lap fencing pack @ 3ft high consis.. Covering an area of 31ft 6" the pressure treated traditional lap fencing pack @ 3ft high consis.. 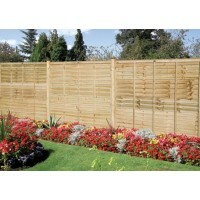 Covering an area of 37ft9" the pressure treated traditional lap fencing pack @ 3ft high consist.. Covering an area of 44ft the pressure treated traditional lap fencing pack @ 3ft high consists .. Covering an area of 50ft 3" the pressure treated traditional lap fencing pack @ 3ft high consis.. Covering an area of 56ft 6" the pressure treated traditional lap fencing pack @ 3ft high consis.. Covering an area of 19ft the pressure treated traditional lap fencing pack @ 4ft high consists .. Covering an area of 25ft 3" the pressure treated traditional lap fencing pack @ 4ft high consis.. Covering an area of 31ft 6" the pressure treated traditional lap fencing pack @ 4ft high consis.. Covering an area of 37ft 9" the pressure treated traditional lap fencing pack @ 4ft high consis.. Covering an area of 44ft the pressure treated traditional lap fencing pack @ 4ft high consists .. Covering an area of 50ft 3" the pressure treated traditional lap fencing pack @ 4ft high consis.. Covering an area of 56ft 6" the pressure treated traditional lap fencing pack @ 4ft high consis.. Covering an area of 19ft the pressure treated traditional lap fencing pack @ 5ft high consists ..